To Excel Or Not! Jo-Ann Westlake of 123ITworks explains how to become best mates with the latest software options. It’s vital that you make sure that all your costs are covered and you are making a profit. But how? Many contractors are not certain whether they should use the tried and tested Excel spreadsheet or if it’s time to look at an estimating software. The next step from using Excel is using a software such as EstiMATEit, which is a simple easy to use online software, that allows you to create an estimate, using your methods of working and rates, without being over complicated. It gives you the flexibility of Excel but without the problems. Here we look at the most common questions we receive from contractors. A A university study has shown that you are not on your own, nearly 90% of spreadsheets contain errors which could mean some costly mistakes if you don’t spend time checking them. 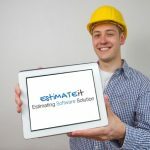 EstiMATEit handles all the maths backend for you, so you can rely on everything adding up, so you no longer have to stress. A But easily done, spending hours creating a template, to then have it overwritten by someone in the office. The template feature stops this, a copy can be created every time you needto use it and your template is safe for another day. Q I have to go back and add up the list materials I need – I just want one list showing me the total of what to order. A Unless you are an advanced user of Excel, this can be a time-consuming job, however, switch to a software package and a convenient total of each of the materials and labour used is at a click of a button. Not only that, the components of any of the bill of materials used in the estimate will also be calculated for you. Q Excel doesn’t print my letter to my customer, I have to use another software for this. A Excel is not designed to print professional documents for your customer, the format is not always clear and setting the print area up and getting your logo and contact details just right can be tedious. EstiMATEit presents your estimate in professional, laid out letters and estimates that can be produced in PDF format ready to email to your customer. Q I can only use Excel on my computer at home or the office, there are times when I want to work onsite or on the road. A The advancement in mobile technology means that you can use this type of software on the move, and on any device anywhere in the world, you are no longer limited to having to be at your desk on your computer. Q I have material costs and labour rates in different spreadsheets and have to keep jumping around to find them. A Regular users of Excel love it, unfortunately, what starts out as one spreadsheet soon spawns lots of others and you have so many links you feel like you are Diana Ross in a chain reaction, jumping from different tabs or worksheets picking up information. We have made it possible to have one central cost library that you populate with your rates. The rates can be accessed within any estimate and with its intelligent search facility, you can easily find and add the cost to your estimate. Q I will put up with Excel because it is cheap, changing to a software will cost too much. A You would be surprised, advancements in Cloud technology has meant that the cost of a dedicated estimating software can be as little as £20+vat per month.